﻿﻿﻿﻿T﻿﻿﻿﻿andoori Chicken is among the most famous dish of Indian cuisine all over the world and it has made tandoori cuisine famous worldwide. A trip to India is not complete without tasting this marvelous dish. The spices and coloring gives the chicken a wonderful appearance and produce sensation in the mouth. The chicken is marinated in yogurt and seasoned with spices, and then baked in tandoor. 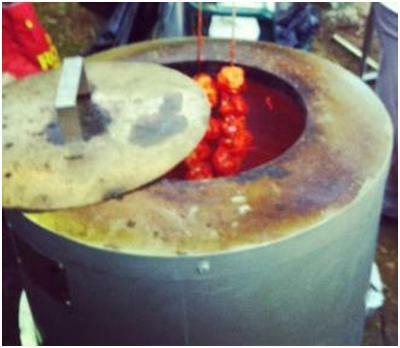 Tandoori chicken gets its name from the ovens called tandoor they are cooked in. A Tandoor is a cylindrical large drum like oven made from clay heated with charcoal or wood, they can reach a very high temperature this high temperature helps in cooking the surface of the meat very fast and hence sealing all the juices inside. You probably do not have a tandoor but outdoor grill or the oven will roast the chicken as good as tandoor will do. The nicest thing about this dish is that it is easy to make and you can cook on the grill or in the oven anytime you feel the urge to eat some. 1. Remove skin from the chicken and wash thoroughly under running tap water. Place the Chicken in a bowl. 2. Tilt the bowl and keep a support under the bowl to keep it tilted for a while so that all the water from chicken drains out, or place the chicken inside of a strainer and let the chicken drain well, otherwise marinade gets watery. 4. In a large bowl, add yogurt, grated ginger, minced garlic, Tandoori chicken masala, salt, red chili powder, turmeric powder, garam masala, kasoori methi, red color (opional), lemon juice and oil or melted butter or ghee and mix them together and make a smooth paste. 5. Add washed chicken in the marinade and mix it well. of the refrigerator and allow it to come to room temperature. ​ lightly oil the grate of the grill. them to other side and let it cook, apply the marinade and oil or butter to other side and cover the grill. 6. Keep the lid closed as much as possible. Lift the lid only to apply marinade and brush oil on the chicken in between. Keep a close enough eye out to prevent burning. Chicken thighs and legs take longer to cook. 7. Turn the Chicken as often as needed to prevent burning and keep the grill cover on so the Chicken cooks through quickly. 8. Cook till the chicken become tender. To test insert a fork or a knife in the chicken. It should go in with ease and the juices should run clear. However, the meat and juices nearest the bones might still be a little pink even though the chicken is cooked thoroughly. Do not overcook otherwise chicken become dry. Timing of cooking chicken varies because grill temperatures vary from grill to grill. 9. When chicken become tender take it off the grill and place it on a platter and allow barbecued chicken pieces to rest on a platter for 10 minutes before serving. This will help keep the chicken juicy and not let all the juices run out when the chicken is cut in. You do not have grill or tandoor to roast the chicken, but do not get discourage you can bake chicken in the oven whenever you feel urge to eat it, it taste as good as roasted on the grill. 1. Preheat the oven at 400 degree. 2. While oven is heating line the baking tray with a foil and place the rack over it. Now carefully place the marinated chicken over the rack leaving some space in between each piece. The rack helps in avoiding the contact of chicken with the dripping juices released while cooking and keep chicken dry and crispy on the surface. 3. Place the tray in the hot oven and bake it for 8 to 10 minutes, with the tongs turn the chicken pieces to other side and with the spoon apply some marinade and some oil. Let the chicken bake then turn them again and bake for another 8 to10 minute. Timing of cooking chicken varies because oven temperatures vary from oven to oven. 4. Bake the chicken till it become tender. To test insert a fork or a knife in the chicken, it should go in with ease and the juices should run clear. However, the meat and juices nearest the bones might still be a little pink even though the chicken is cooked thoroughly. Do not overcook otherwise chicken become dry. 6. Once chicken become tender turn the oven on broil for few minutes so that top surface of chicken become little crisp, take the tray out from the oven and transfer it in to a plate or a platter. 7. Allow baked chicken pieces to rest on a platter for 10 minutes before serving. This will help keep the chicken juicy and not let all the juices run out when the chicken is cut in. Heat the tandoor, pierce the chicken pieces onto a tandoor skewer and insert in the tandoor and cook for 15 to 20 minutes or until chicken become tender. 1. Never place cooked chicken on the same bowl or the platter that held raw chicken, it could lead to illness. 2. Cooking times will vary if you have a variety of chicken pieces. Boneless less chicken pieces or chicken breast take less time to cook. 3. Tandoori chicken masala can be purchase from any Indian grocery store. 4. The red food color is added for the looks and has no effect on the taste. If you do not like it you do not have to add color. 5. For marinate thick hung yogurt is preferred otherwise marinate become watery and it would not coat the chicken. If you do not have thick yogurt, take plain yogurt, line a strainer with a cloth or a kitchen towel, put the strainer inside a mixing bowl. The bottom of the strainer must be suspended at least 1 inch above the bottom of the mixing bowl. Pour about 3 cups of yogurt in the strainer and place it in the refrigerator and leave it for 3 to 4 hours or until all the liquid has drips out of the cloth and into the bowl. Scoop out the yogurt and it is ready to be used. Strained yogurt should be thick and less than half the original volume.